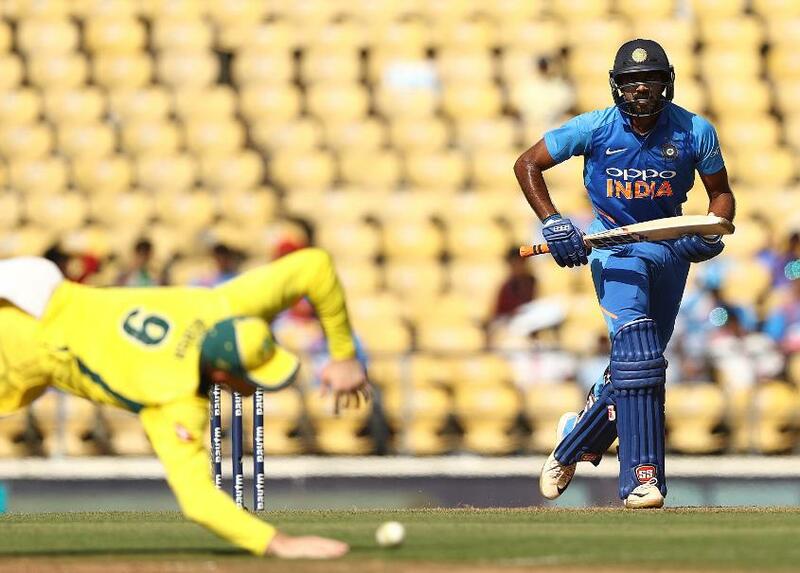 Vijay Shankar, the India all-rounder, had bowled just one over all match before Virat Kohli, his India captain, threw him the ball in the final over of the second one-day international against Australia with 10 runs to defend. Australia's Marcus Stoinis had done all the hard work till then, playing out the dangerous Jasprit Bumrah and Mohammed Shami, and was backing himself to knock off the runs against a relatively inexperienced bowler. Shankar, however, rose to the occasion, eager to make amends for conceding 13 runs in his only over of the day before this. He struck with his very first ball of the over to trap Stoinis in front for his first-ever ODI wicket. Two balls later, he had his second when he castled Adam Zampa to seal a thrilling eight-run win for India. "I was literally waiting for the opportunity," a delighted Shankar, who also made a vital 46, told the host broadcaster after the match on Tuesday, 5 March. "After the 43rd over I was telling myself I'm going to bowl the last over, and I am going to defend it." That it all came down to him was because of a gamble Kohli took. By the 45th over, spinners Kuldeep Yadav and Ravindra Jadeja had been bowled out. The captain still had two overs left from both Bumrah and Shami, leaving either Shankar or Kedar Jadhav, who had bowled eight till then, with one more to send down. Kohli decided to attack with his premier fast bowlers and go with his other pace option in Shankar for the final over. "I was thinking [to bowl Shankar in the] 46th over," Kohli said at the presentation. "But again, I spoke to Rohit [Sharma], I spoke to MS [Dhoni] and both of them said [we] might as well take the game to the last over; with Shami and Bumrah, [if] they get us a few wickets, we'll be right in the game. "And yeah, look, he was quite composed after a first over like that on a slow pitch. He just put the ball in the right areas and he just asked the batsman to do the job after that. He showed great composure." He had Bumrah, who went for just 29 on the day, in his ear. "After the 48th over, Bumrah came up to me and told me, ‘the ball is reversing a bit.’ He told me that I need to hit the right length on this wicket, where I give myself a chance to hit the stumps." India now have a 2-0 lead against Australia. But more than the result, it's been a chance for them to settle on their combination for the ICC Men's Cricket World Cup 2019 in England and Wales, starting 30 May. Shankar is one of those auditioning for a spot, and while he admitted that a game like this gave him confidence, he insisted that selection to the World Cup wasn't on his mind. “The Nidahas Trophy [in 2018 in Sri Lanka, where he made his T20I debut] has taught me many things," he said. "I learnt to stay neutral after that ... I’ve said previously also that I never think about the selection or World Cup because it’s a long way off from now. Every game is very important. I just look to give my best and win a game for my team."